If you’ve ever traded options, you’ve probably heard of the Collar Trade. The standard collar strategy is a great way to protect your investments in an unsure market. But what if you could make 25-30% more without taking on any additional risk? You can—and at OptionsANIMAL, we can teach you how. Read on for some starter tips, then sign up for a webinar for an even deeper look into how to maximize your investments. Why Change the Standard Collar Trade? The problem with the standard collar trade strategy is that it lacks big upside profit potential. A Dynamic Collar Trade protects your trades just as much as a standard collar trade, but it also lets you take part in bullish underlying moves and offers potential returns of 25-30 percent — roughly four times as large as a standard collar (6-8 percent). Trading Today’s Market – What is Your Fear Costing You? The recent slide in the stock markets due to European debt crises and economic woes has spread a lot of fear into the already-fragile collective trading psyche. Stock traders who invested heavily just before the downturn in July and August are especially fearful. Although stocks have since recovered, and even began hitting new highs again in late January, many traders fear the market is due for another pullback. Cautious stock traders and stock options traders stay away from high-flying stocks such as Netflix, Inc. (NFLX), Baidu, Inc. (BIDU), Apple Inc. (AAPL), and lululemon athletica, inc. (LULU), but subsequently miss out on other opportunities as the values of those stock options continue to rise. How can anyone possibly have the nerve to enter the market these days? The answer lies in a stock options strategy called the “collar strategy” or “collar trade,” which protects underlying positions against downside losses. If you own or have just bought stock, you can create a standard collar by buying a put, then selling a call to offset the put’s cost. A collar strategy is conservative and low-risk/low-return, because the long put caps any risk below its strike price, and the short call reduces the cost of that put while slowing any gains above its strike price. If both options expire in the same month, a collar trade can minimize risk, allowing you to hold volatile stocks. However, a standard collar strategy also restricts the trade’s potential profit to 6-8 percent, which leaves money on the table during bullish trends. How can you create greater upside? The following example shows how to modify a collar trade to boost potential profits by selling a call that expires 60- 90 days after the long put. Let’s assume you buy 100 shares of stock at $50 on Jan. 15. 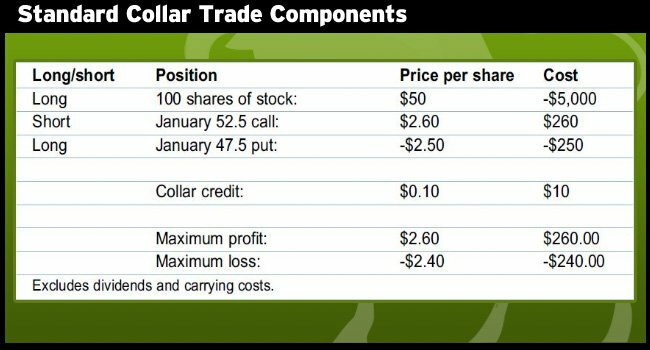 To build a standard collar strategy, you could first buy a put that expires in 60-90 days with a strike that is at-the-money (ATM) or slightly out-of-the-money (OTM). The last step is to sell a OTM call in the same month. For example, if you bought a March 47.5 put for $2.50 and sold a March 52.5 call for $2.60, the spread offers a credit of $0.10, because you collected more by selling the call than the put cost. If the value of your stock drops below $47.50, losses are capped at $2.40 (4.8 percent), but if the stock advances above $52.50, gains are restricted to $2.60 (5.2 percent). The long put gives you the right to sell stock at $47.50, regardless of how far it falls. But the short call obligates you to sell stock at $52.50 — even if it doubles in price by expiration. Take a look at the following graph for further clarification. This collar trade has a return-to-risk ratio of only 1.08, which isn’t very attractive. 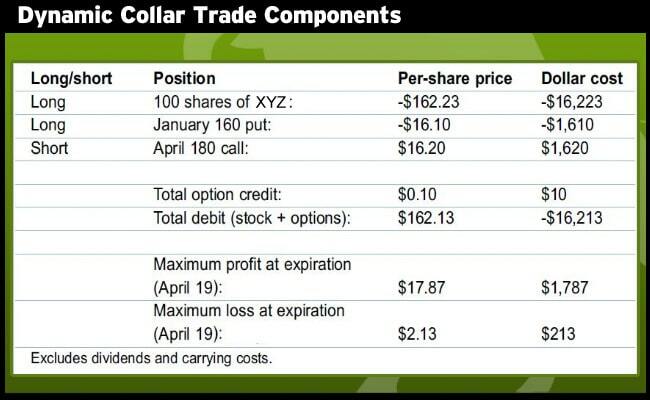 However, you can increase a standard collar’s potential gains by selling a call in a later expiring month. One way to adjust a standard collar strategy is to sell the call 60-90 days further out in time than the long put, which lets someone else pay for your downside insurance. When you sell the call for a dynamic collar trade, try to 1) collect enough premium to pay for the long put, and 2) ensure its strike price is above the underlying stock’s price. If the short call is assigned, forcing you to sell stock at the strike, you want to sell the shares to the call’s holder at a profit. But after the long put expires, won’t the remaining covered call position (long stock, short OTM call) lack downside protection? At this point, don’t you still have to wait for the short call to either move into the money or be assigned? Before answering that question, let’s discuss a couple of key characteristics of stocks that work best in this type of trade, focusing on fundamentally solid, volatile stock investments. When searching for suitable stocks for options trading, you should focus on fairly volatile ones with strong fundamentals. Fundamental data may change among industries, so specific guidelines aren’t always helpful. For instance, a P/E ratio of 20 for an industrial stock is probably expensive, but a solid technology stock with that same P/E might be a steal. Try to find a stock for your options trade with the following characteristics: quarterly earnings growth of more than 15 percent over the last two years, no debt or a debt-equity ratio of less than 1.0, and return on equity (ROE), assets (ROA), and invested capital (ROIC) of more than 15 percent. The second key part is volatility, which represents how much the underlying stock moves (up or down) on a given day. More volatile stocks are ideal, because their options have a better chance of reaching the short call’s strike by expiration. Stock candidates for this modified collar trade should have betas of 1.3 or higher. Trades can adapt to change. So, when you ask “But what about a dynamic collar’s downside risk after the long put expires?” The answer involves a paradigm shift in how you should view this trade. Many traders place a stop loss order to control risk, but that is a static way to trade. Instead of simply entering a collar trade and hoping the market rallies, be ready to adjust it as market conditions change to exploit any trends (or lack thereof). The difference between expiration months shouldn’t bother you, because you will likely adjust the trade before either option expires. A standard options collar trade protects against sharp drops in the underlying equity in exchange for limited gains on the upside. But this dynamic collar trade can boost potential profits if you trade it actively and pick stocks with solid fundamentals. The position eliminates your fear of volatility and can change the way you trade your options. Over time, the dynamic collar can exploit market downturns and maximize profits as stocks rally. For more information on how to structure other trades like the collar trade and how to adjust losing trades into winning trades, visit www.optionsanimal.com. For more information on the best ways to invest your money, contact us. We’d love to hear from you, answer questions you might have, and give you a free evaluation to give you a better idea of what OptionsANIMAL can do for you. Call us now at 1-888-297-9165. ← Concentrate On Your Talents, Not Your Weaknesses!